On a rainy day in September 1925, Frida Kahlo and her boyfriend Alejandro Gómez Arias were in Mexico City waiting for a bus that would take them to her home in Coyocán, Mexico. The bus came, and they climbed on. As Frida and Alejandro chattered about her plans for medical school, the driver approached a risky intersection and decided to take his chances. Seconds later, an electric trolley rammed into the bus, destroying it and launching bodies everywhere. 18 year-old Frida disappeared in this confusion, and Alejandro, also injured, discovered her with a metal pole protruding from her abdomen. After someone pulled the pole out, an ambulance rushed her to the hospital, where doctors treated a fractured pelvis, a dislocated shoulder, two broken ribs, and shattered bones in the right leg and foot. This accident was the beginning of an unbearably painful series of physical ailments that would persist for the rest of Kahlo’s short life. Only two things would offer solace: painting and muralist Diego Rivera. 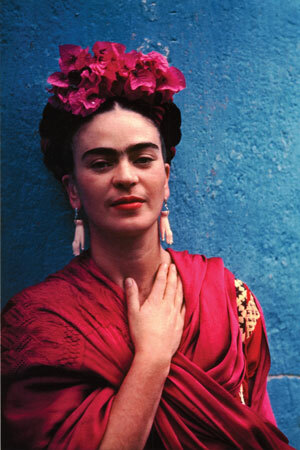 Frida Kahlo was born in 1907 to two Jewish immigrants. A poster child for Freud’s theories, she adored her father and resented her mother. The family home in Coyocán, Mexico was painted cobalt blue outside, and for this reason it became known as the Blue House. Frida had three sisters, and though her status as daddy’s favorite set her apart from the others, her affliction with polio beginning in 1913 would forever mark her as different. After she healed, Frida was left with a withered right leg that she covered with pants and long skirts. During her recuperation, her father lavished attention on his favorite child, who had once been an energetic tomboy. He helped Frida exercise and, in an attempt to find ways of entertaining her, he gave his daughter some paints.Guillermo Kahlo preferred Frida to his other children because she was the most intelligent. And in 1922, Frida made Guillermo even prouder when she became one of 35 women from a student body of 2,000 to be admitted to the prestigious National Preparatory School, or El Prepo, in Mexico City. She wanted to study medicine, but upon arriving to the vibrant intellectual center of her country, she discovered political activists, artists, communists, and other people who dared to dream and question. Lopping off her hair and switching to overalls from the drab outfits of a good Catholic girl, Frida fell in with the Cachets, a group of pranksters led by Alejandro Gómez. One of the Cachets’ victims of trickery was a tall and fat muralist, Diego Rivera, who was commissioned by the school to paint its auditorium. Spunky Frida stopped at nothing to annoy Rivera, 20 years her senior. She and the Cachets soaped the stairs so Diego would slip and fall, stole his lunch, and popped water balloons over his head. Only years later would her taunting and teasing of Diego evolve into a love affair. In 1925, Kahlo suffered the bus crash and turned to art during her recovery. During this period, Alejandro never returned her letters. After one frustrating year of prolific painting and painful progress, she encountered Diego again when he was working on a mural in Mexico City. Summoning him impetuously from his spot high near the roof, she asked his honest, unflattering opinion of her work. 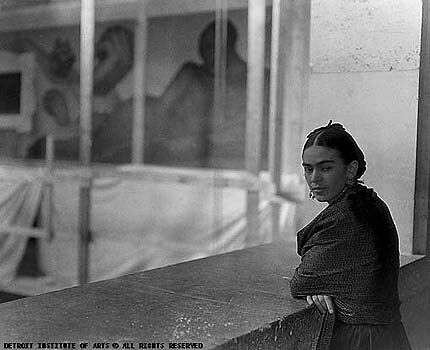 Rivera inspected her canvas and told her, “Keep it up, little girl.” Then he asked if she had any more, and Kahlo seized the opportunity to invite him to the Blue House to show off the rest of her work. Critics have often said that the two artists had a lot in common, with their love of iconoclasm and Mexico being among the strongest bonds. In 1929, when Kahlo was 22 and Rivera 42, the two were married in the Coyocán courthouse, though Kahlo’s mother did not attend the wedding because she hoped her daughter could find a more attractive, conventional match. Kahlo officially retained her own name, and the newlyweds moved into a stylish house in Mexico City shared by some other communists. Later that same year, Kahlo became pregnant, though she had an abortion because her damaged body could not handle the pregnancy without putting her own life at risk. Her repeated inability to have children was a source of pain for Kahlo, who expressed this frustration in her paintings through the major themes of childbirth, blood and fertility.In 1930, Kahlo went with her husband to America. During this time, and for much of her conjugal life with Rivera, Kahlo did not receive recognition as an artist in her own right. “Wife of the master mural painter gleefully dabbles in works of art,” read one headline when the couple visited Detroit. Rivera was used to being the center of attention, and he often neglected Kahlo for his art — not to mention for numerous extramarital trysts (one of the cruelest affairs Rivera had was with his wife’s own sister, Cristina). When Kahlo saw that she was second in line, she abandoned her own artistic aspirations and became a good housewife, bringing lunch to Rivera’s workplace and devotedly hanging around him. Unfortunately, these years proved to be some of Kahlo’s loneliest and unhappiest. Though she was good at keeping up appearances, always witty and charming in public, Kahlo intensely hated America, with its extremes of poverty and wealth. In addition, her withered right leg also made it difficult for her to keep up with Diego, as he rushed about from commission to commission. Nonetheless, Kahlo produced some great works during this period, specifically her first fantasy or symbolist paintings, including Self-Portrait on the Border Line. 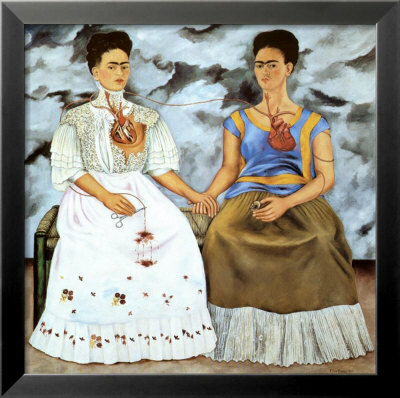 Los Dos Fridas "The Two Fridas" reportedly showing the two sides of Frida; loved and unloved. The couple returned to Mexico in 1933, though not exactly in a state of marital bliss. Both Kahlo and Rivera had many extramarital affairs during this time. Among Kahlo’s many lovers — both male and female — was Leon Trotsky. Exiled from Russia by Stalin, Troktsy and his wife Natalia Sedova came to stay with Kahlo and Rivera at the Blue House in 1937 after the Mexican couple had moved back home. While Sedova and Rivera were in the hospital for various ailments, friendship, flirtation and ultimately romance grew between the spunky Kahlo and the older, gallant Trotsky. This romance inspired Kahlo to paint again, and she dedicated one of her numerous self-portraits to Trotsky. In 1938, Kahlo met André Breton, who helped arrange for some exhibits of her work. After a few minor exhibitions as well as one major solo exhibit at the Julian Levy Gallery of New York City, word about Kahlo’s art started to spread. Nickolas Muray, a photographer and future lover, set up the New York show for her, where she exhibited 25 paintings. She sold a number of them and returned to Mexico with jubilance. At 31, she was finally financially independent and established in her own career. Art grows out of sacrifice, and Kahlo’s works were no exception. Rivera once called her art “agonized poetry,” and Kahlo’s physical suffering and emotional loneliness indeed provided material for her primitivistic, Surrealist paintings. At the core of this agonized poetry were Kahlo’s unhappiness with and adoration of Rivera. When Kahlo and Rivera ultimately divorced in 1940, the periods before and after their separation were among Kahlo’s most difficult and most productive. Turning to religious symbolism and themes of death, Kahlo solidified her position among the Surrealists with continued support from Breton, though she allegedly denied any affiliation with the Surrealists. Whatever her official artistic designation, Kahlo was at last cherished as a respected artist and no longer simply considered Rivera’s girlish wife. In the last decade of her life, Kahlo enjoyed a more peaceful existence, teaching for a while at the renowned Mexican art institute, La Esmeralda. Assailed by new health problems, this time with her spinal cord, Kahlo turned to her art as an outlet for her pain. Easel propped up, she painted directly from the hospital bed. In 1950, she returned to the Blue House, and a year later she and Rivera remarried. In 1953, Kahlo and her four poster bed were transported to Mexico City’s National Institute of Fine Arts for the first solo exhibit of her work in her homeland. While Diego Rivera had greatly influenced her life, Kahlo’s distinct style eliminated any doubts that he might have influenced her art. Fragile and sensitive, Kahlo developed her own themes, her own form of fierce nationalism, and her own social consciousness. When she died in 1957, hundreds of admirers came to see the diminutive woman of great importance asleep in her coffin, flowers woven into her hair.